1. Put the yolks and 2 tsp lemon juice in a small blender or food processor; whizz for 30 seconds. Melt the butter in a small pan then, with the blender running, trickle it in. 2. Warm a bowl by pouring a little just-boiled water into it, then empty and dry. Scrape the hollandaise into the bowl and stir in the mustard; season with salt, pepper and more lemon juice to taste. Leave in a warm (not hot) place for up to 30 minutes. 3. 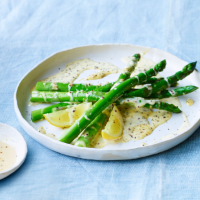 Lay the asparagus out in a single layer in a large frying pan. Half-cover with just-boiled water, add a pinch of salt and place over a high heat. Simmer briskly, turning the spears occasionally, until the water has evaporated and the asparagus is tender. Serve with the warm sauce and lemon wedges, if liked. RECIPES WITH RAW OR SEMI-COOKED EGG ARE NOT SUITABLE FOR PREGNANT WOMEN, ELDERLY PEOPLE,OR THOSE WITH WEAK IMMUNE SYSTEMS. This recipe was first published in Mon May 01 15:13:47 BST 2017.